Season 8 of Fortnite is now at the midpoint, and Epic has released a fresh batch of challenges to keep the millions of Fornite players on their toes this week. The free challenges corresponding to season 8, week 5 are the following: Deal damage with Scoped Weapons to opponents, Search chests at Paradise Palms or Shifty Shafts, and Complete a lap of the Race Track in Happy Hamlet. The first challenge of the week involves dealing damage with a specific kind of weapon, a challenge those who have been playing Fortnite this season will be familiar with as it was last seen in week 1. This one’s a slight variation of the one seen earlier this season though, as it involves dealing a total of 200 damage points to opponents with any kind of scoped weapon you can get your hands on. There are scoped variants of weapons such as the pistol and assault rifle to be found on Fortnite’s map (by searching chests for instance). Also, since all sniper rifles have scopes, damaging opponents with this weapon will count towards completing this challenge. Once you’ve got one of these equipped, it’s just a matter of searching for opponents to fire your guns at… As usual, it will be easier to get this challenge done if you play a squad-based mode such as Team Rumble. This gameplay mode allows you to throw caution to the wind and hunt down other players more aggressively as you’ll respawn with any weapons you’ve collected if you are eliminated. The second free challenge available to players this week involves searching a total of 7 chests at two of the game’s named locations: Paradise Palms or Shifty Shafts. I’ve marked both of these locations on the map above (note: the start location for the race track challenge is also marked on the map). 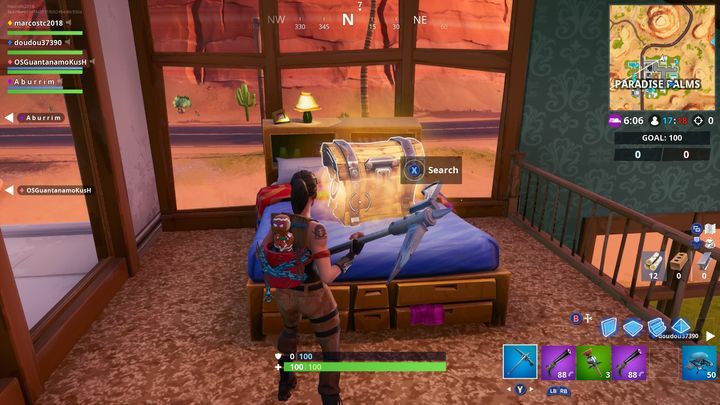 If you’re very new to Fortnite, know that chests are usually found within buildings, and to access the bunch of goodies within all you need to do is approach the chest in question and keep the use button pressed until the chest pops open (this is the X button on Xbox One and Square button on PS4). Challenge number three is no doubt the week’s most interesting one – it’s a bit different from what we’ve seen from Epic in Fortnite so far in the season. This challenge involves completing a lap of the race track in Happy Hamlet. The image below shows the starting point for the race, which is a little to the northwest of Happy Hamlet. 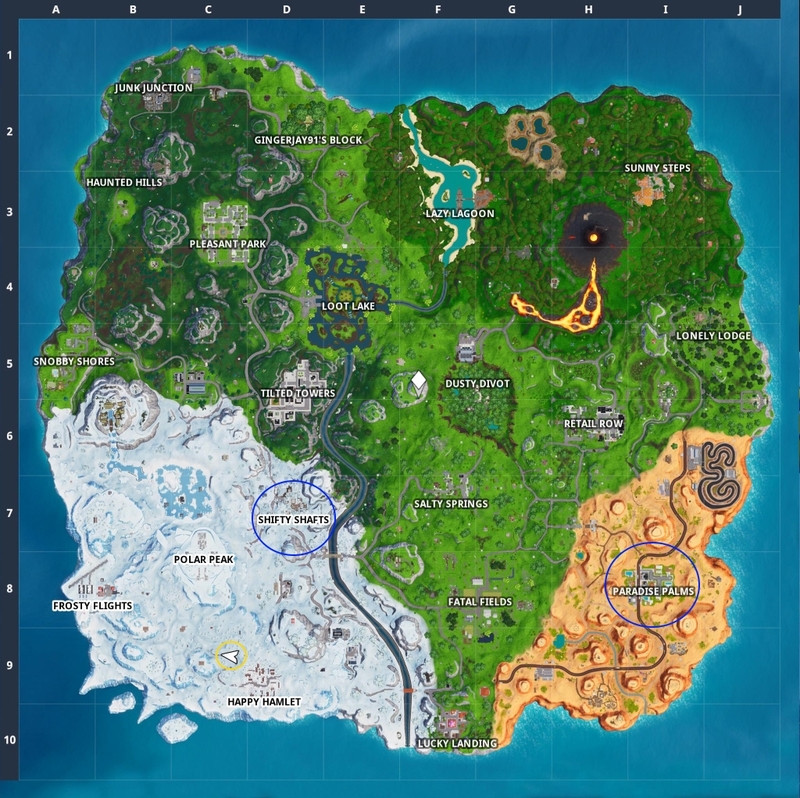 This is a named location located in the bottom part of the snow biome (the snow-covered part of the map to the south west, see map above). There are a few Baller vehicles parked at the race start location, and once you hop into one of these you can begin the race proper. If no Baller vehicles are available there you might be able to find one at another location – for instance, the Expedition Outpost located to the north east of Happy Hamlet. To complete the race, simply follow the track, going through the blue arches which mark each checkpoint. 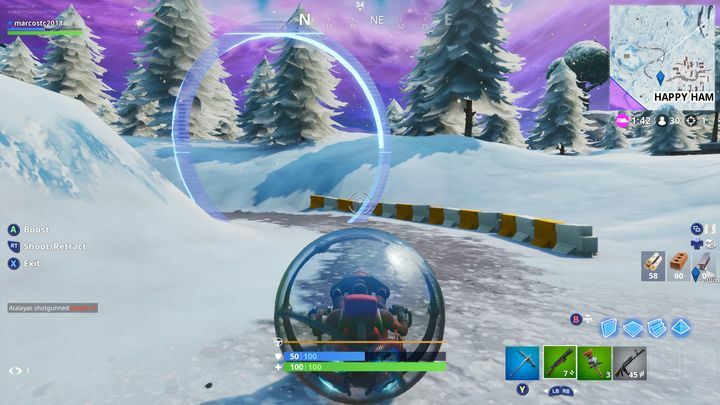 One of these circles is up in the air though – so you’ll either need to build a ramp to make it through or resort to the Baller’s “suction cup” (which you can shoot using the gamepad’s right trigger). 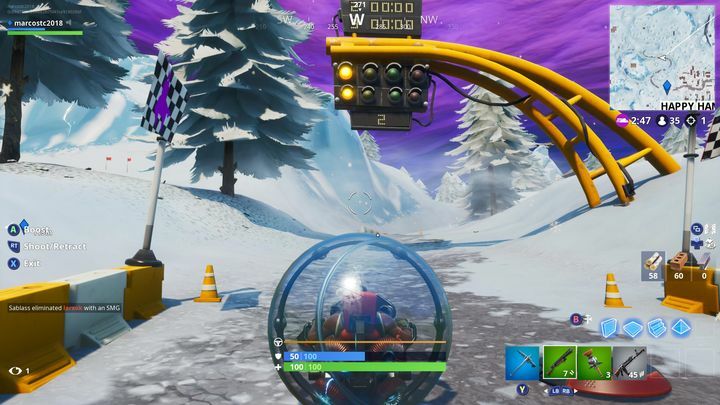 This elevated checkpoint happens to be below an ice arch – the Baller’s suction cup can stick to the top of the ice arch, hoisting you in the air in order to pass through the checkpoint and continue the race. Once you’ve completed the lap by passing through the race’s start arch, you will have completed this third challenge of week 5. Also, bear in mind you’ll have to be wary of other players while completing the race if you’re playing solo Battle Royale – some might be on the lookout for other players to eliminate at the race track location. This is another good set of weekly challenges for this season then, and it would be a great thing if Epic keeps releasing more worthy challenges for Fortnite players to enjoy in what remains of season 8 too.